The race starts at 7:30 am, at Watsons Bay and participants will follow the red route marked "Run OUT" towards Nielsen Park, via the Parsley Bay Bridge (3km). After the swim at Nielsen Park (250m), participants will run back along the "Run IN" route towards Parsley Bay (2km) for the second swim (350m). After the swim the run route goes through Parsley Bay Reserve...and towards Watsons Bay (1km), via Gibson's Beach Reserve, for the final swim (100m). Competitors will enter (and exit) Nielsen Park via Coolong Road. Competitors will wind their way around Shakespears Point, descend the stairs and arrive at the beach on the eastern side where they can transition for the swim leg (300m). After the swim, put your runners back on and head out the same way you came in. On first (Red) leg of run, competitors will run across the iconic Parsley Bay Suspension Bridge and head towards Neilsen Park for the first swim. On the retrun leg (Blue), you will approach Parsley Bay from Parsley Road. Be careful of the steep decent into the park! Then run through the Park towards the Beach for a 300m swim. To exit the park you will run through the secluded and stunning short bushland circuit, that takes you to a waterfall at the head of the gully. Look out for the Eastern Water Dragons which can be seen sunning along the watercourse. Registration will take place in front of the Watsons Bay Hotel, and will open at 6:45am on the day of the event. The first leg will involve running out of Watsons Bay via Gibson's Beach Reserve. 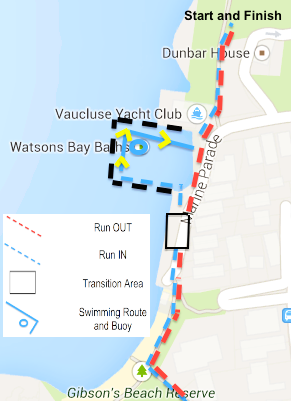 On the return leg (Blue), there will be a swim (100m) at the Watsons Bay baths prior to finishing the course in front of the Watsons Bay Hotel. These Baths are an hidden treasure of the Sydney Harbour foreshore, and you could appreciate their beauty and breathtaking scenery as you finish your race.